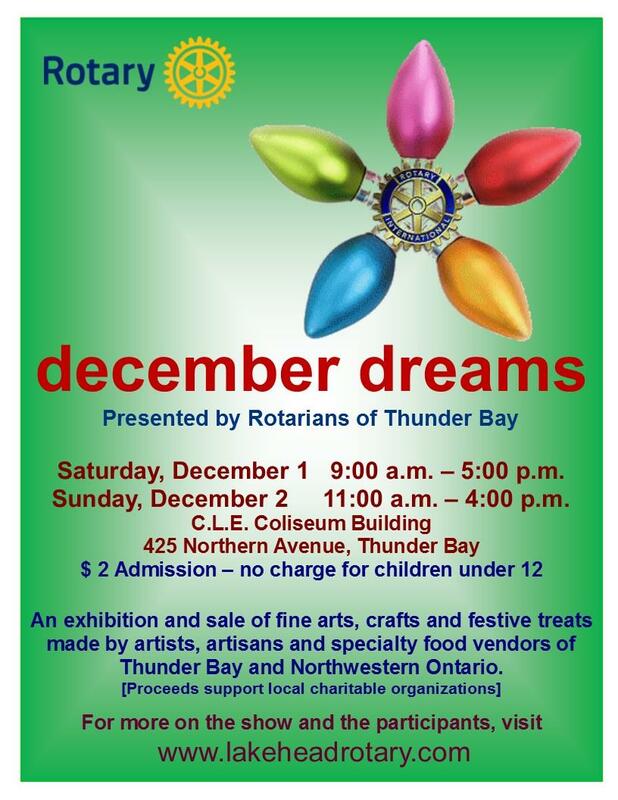 The annual DECEMBER DREAMS fine arts and crafts show is presented by Lakehead Rotary and produced by Rotarian Clint Kuschak who is also a participating artisan with his wife Barbara - meet them in the Glass Garden booth at the show. The show, in its 11th season, features artists and artists from Thunder Bay and area communities. Lakehead Rotary presents this show to promote the work of local and regional artisans. Many of these artisans rely on shows like December Dreams to exhibit and sell their work as they are unable to sustain retail outlets. Their homes and their workshops and retail spaces. The show includes a wide variety of crafts in various mediums plus works of fine art by area artists. December Dreams is one of the larger shows in the marketplace and approximately 2,000 patrons take in the show each year plus hundreds of children. The admission is $2 for adults and free to children 12 and under. All proceeds from this event are returned to the community through Lakehead Rotary's donations to local charitable organiations - especially those who are engaged in delivery food and comfort to those in need at this time of year.